The US has announced a ban on large electronic devices from cabin baggage on passenger flights from eight Muslim majority countries. The Department of Homeland Security (DHS) said extremists were seeking “innovative methods” to bring down jets. Bombs could be hidden in laptops, tablets, cameras, DVD players and electronic games, it said. The measure will affect nine airlines operating out of 10 airports. 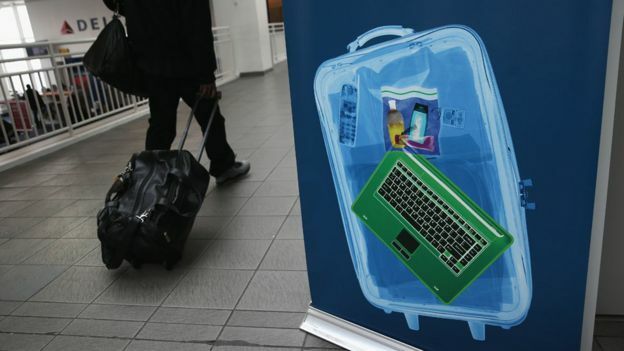 Large electronic devices will only be allowed on board in checked baggage. Phones are exempt from the new rules. Will the new US travel rules affect me? US officials said the airlines had been given 96 hours, beginning at 07:00 GMT on Tuesday, to ban devices bigger than a mobile phone or smartphone from cabins. They said the ban had no end date. 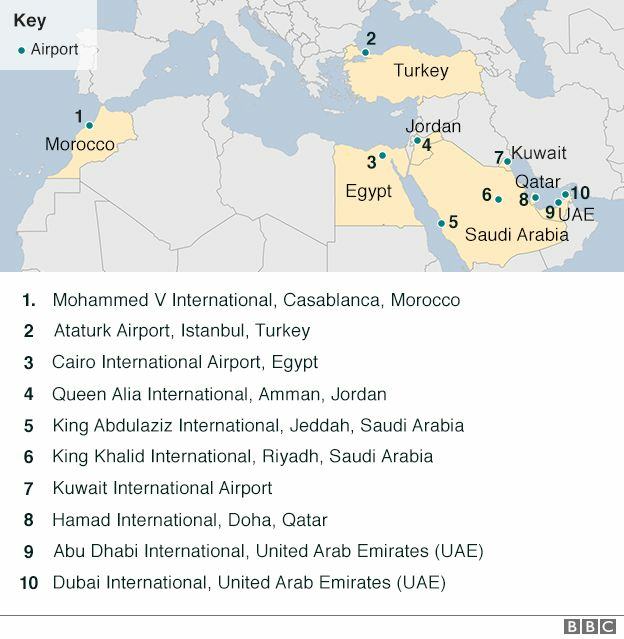 AFP news agency said passengers on some 50 flights a day from some of the busiest hubs in the Middle East, Turkey and North Africa would be required to follow the new rules. The restriction is based, we are told, on “evaluated intelligence”. That means that US intelligence has either intercepted discussion of a possible extremist plot or has been passed word of one by a human informant. The Middle Eastern and North African airports affected are nearly all ones with close, friendly relations with Washington, so this will be seen by some as a drastic and unpopular measure. Wealthy Gulf Arab business leaders flying to the US, for example, will no longer be able to work on their laptops mid-flight. But aviation security experts were alarmed by an incident in Somalia last year when the insurgent group al-Shabaab smuggled an explosive-filled laptop on a flight out of Mogadishu, blowing a hole in the side of the plane. The aircraft was still low enough that the pilot was able to land the plane safely. In a statement, the DHS said: “The US government is concerned about terrorists’ ongoing interest in targeting commercial aviation, including transportation hubs over the past two years, as evidenced by the 2015 airliner downing in Egypt; the 2016 attempted airliner downing in Somalia; and the 2016 armed attacks against airports in Brussels and Istanbul. Homeland Security Secretary John Kelly called members of Congress over the weekend to explain the security issues behind the ban, congressional aides said. The restrictions are said to have been under consideration for several weeks.